Lead the Rebel Alliance with strength of character, passion, and drive in this adult deluxe Princess Leia costume. The white, 100% polyester dress has long sleeves and a hood. 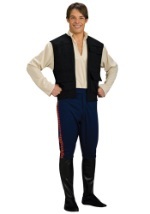 The vinyl belt secures around the waist with Velcro and the wig is styled in Leia’s unmistakable side-buns. You'll be poised to take on a political role in the New Republic in this adult deluxe Princess Leia costume! Join Luke, Han, and Chewbacca for a fantastic Star Wars group costume!